Okay I had to return this because it turned out to be a couple of inches too large for the room. Very disappointing as I have two other rugs the same as this one, and I wanted them all together. These rugs are thick and plush, not too bright and warm and cozy in the winter. Add comfort to each step with this Anatolia handmade rug from Safavieh. The earth tone colors and Oriental design add an Asian-inspired theme to your decor, and the solid wool construction of this rectangular rug adds warmth on cooler mornings. Crafted with an ancient pot-dyeing technique, this rug creates a focal point for your room. This will be the third rug I tried out in my living room, and third time is lucky. I love this rug. It is subtle, yet the rust color throughout adds color. It has a lovely gold hue to it that is very warming. It seems very high quality and is soft and luxurious. It has been shedding a little, as all wool rugs do. But it has only been a week and it is already not shedding as much. It really adds warmth to my living space, has enough color to be interesting but does not overtake any of the other decor. Very pretty, I would certainly recommend this rug. Very nice quality rug that would match the quality of a *** rug. In person it is more beige than the orangey color that is shown in the photo. If you're looking for a gold rug this rug might disappoint. If you're looking for a quality rug, this is the rug for you. Color was more taupe than gold but it actually worked better in my room. Quality surpassed expectations! I love this gorgeous rug, It's very plush, well made and has thick pile. It is also unusual and worked perfectly in my bedroom. I searched a long time for this color and while this rug has more green than I wanted and expected, I am very pleased with this purchase. The weight of the rug is very heavy and it has a very thick pile, the only thing I don't like because it is a wool, the rug it is shedding a lot. I have a dark hardwood floor and so you see all the fuss I hope with time less shedding. Overall for the money that I paid for the rug it is still a good deal.It is beautiful and well described overall. I like it anyways, the yellow color is a little bit more straw like. 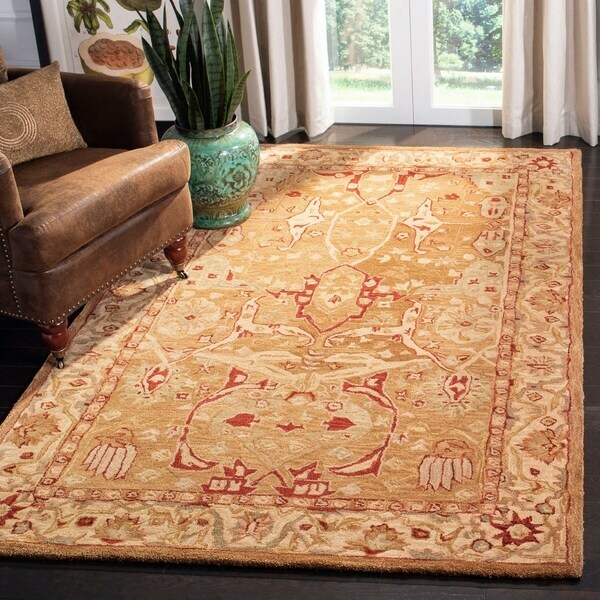 This rug is so much nicer than I expected, considering the price. The colors are rich and true to the picture and the rug is so thick and soft that I almost regretted purchasing a rug pad to go with it. I like this one so much that I’m considering purchasing another one to go in another room. Perfect for what we wanted. The color is true and it still looks good. An incredible deal for a rug of this quality. It is in my office and I love how it feels on my bare feet ! What can I say about the quality but excellent!!! Of everything I've ever bought here, this is the one that looked nothing like its picture. Vibrant? Bold? How about cartoon? I hope Habitat for Humanity could find a good home for it. "Is it a true red or more rust colored?"